In 1979 the Secretary of the Navy promulgated that "Retired Affairs Offices" (RAOs) will be established throughout the US and other areas where large numbers of retirees reside near US Naval Stations. The RAOs were established under SECNAVINST 5420.169 and managed under OPNAVINST 1720.3. On November 16, 1981 the RAO officially stood up and became operational. Prior to that time retirees and their families were not allowed on base except for medical emergencies or medical appointments; even then they were to go directly to and from the hospital without any intermediate stops. When the RAO was established it was located in the old Administration Building (#255) at the seafront NAVSTA Subic Bay. Retirees and their families were then allowed on base anytime to visit the RAO. In June of 1983 the RAO moved to the old Red Cross building near the Staff NCO club. In Late 1986 the RAO made its final move into the new Family Service Center (Bldg 225) across from the old NAVSTA Theater. In 1990 there was an earthquake of magnitude 8.2 in Baguio City that caused many retirees to relocate to the US. Many others moved down to Olongapo City and eventually became members of our RAO if they were not already members. This of course increased our workload and also gave us an opportunity to meet many new people whom we may never have met if it were not for the unfortunate earthquake. On 16 June 1991 Mt. Pinatubo erupted. It was the largest volcanic eruption of the century. Volcanologists, believing that Clark Air Base in Angeles City was in great danger of being destroyed by the eruption, advised the evacuation of Clark AFB personnel to NAVSTA Subic Bay in early June. They were never to return! Volunteers from RAO Subic Bay were among the first to offer assistance in any way possible to the evacuees from Clark. Many of us took people into our homes while awaiting their evacuation out of the country and others helped by finding temporary homes for the evacuees and their families. Again as luck would have it, a typhoon set upon us during the volcano eruption. Because of the typhoon winds and rain, not only did the eruption destroy Clark AFB, but it also devastated NAVSTA Subic Bay and NAS Cubi Pt. Prior to the eruption of Pinatubo we already suspected that the bases were history, but the eruption made it eminent. In September 1991 during President Aquino's administration, 16 Philippine Senators voted against renewal of the bases agreement. This ultimately resulted in the withdrawal of all US forces and closure of all US bases in the Philippines in late 1992. At our June 1992 RAO meeting the Director asked the members at the meeting if they wanted to continue to have an RAO off base and, of course, the answer was yes. He then asked for a meeting with Olongapo City Mayor Mr. Richard Gordon. At that meeting he explained our dilemma and asked permission to set up an RAO in his town. The mayor gave us his wholehearted support to our plan. About 20 June the Director was called in to see the Director of the FSC and was given our marching orders. We were to vacate the FSC NLT close of business 15 July 1992. Now it was time to find a new home. After searching over Olongapo to try and find a place big enough for an office, we came up empty handed. A well-known retiree offered us a space above "T's Tavern" as a temporary home until we could get on our feet off base and find a place big enough for us. There were other problems, too. No one knew how one should manage an RAO off of a military installation. Would we be recognized, would we get any funding of any type, would we be able to maintain an FPO address, etc.? The first step was to see if the office could receive the retirees checks from PSD. At that time about 1400 retirees received checks from DFAS via PSD. A phone call was made to DFAS explaining the situation, and check delivery was transferred from PSD to the US Embassy Manila. Initially we had to pick up the checks from the Embassy monthly. Compared to the original number 1400 checks, there are now less than 100 and they come directly to the Director via FedEx. Second was how would we do our banking and handle deposit of pay in the Philippines. The Director spoke with all the local banks and finally was able to achieve a working relationship with Bank of the Philippine Islands (BPI) with clearing time for our personal checks of 30 days. Most other banks wanted 45-60 working days clearing time, and that was not acceptable since most of us live month to month on our pay. (At that time, direct deposit to banks here was not available. Retirees either received their checks here, or had them direct deposited to NFCU and deposited a personal check here.) Third was to work out something with our mail while awaiting approval for an FPO. We started with Worldwide Express. That turned out to be a big mistake, but it took some time to realize it. We later dropped Worldwide Express and went strictly with the local post office, which proved to be safe and reliable. Some history: when we were on base we had a 20% check missing or lost rate. Now it is 1% or less. However, most of our people are now DDS. On November 22, 1992 the last ship, USS BELLEAU WOODS, left with the rear detachment personnel. The RAO had a group on the pier to bid them farewell and help cast off the lines. In mid-1993 we moved into the old "Dollies Tavern," located in the New Ever Hotel on Fendler Street Extension just off Magsaysay Drive behind Police Station "B." 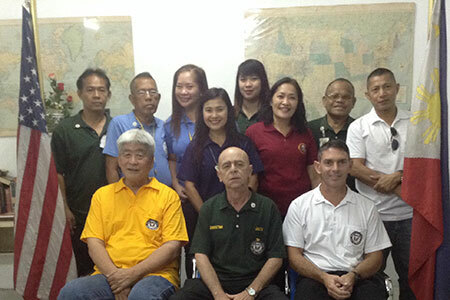 In September 1995, after a long struggle, an FPO address was issued for us and the other RAOs operating in the Philippines, with mail deliveries to the Seafront Compound in Manila. In February 2001 we moved to a new location (formerly Community Market and BlueJeans) at 34 National Hiway (now named Beach Blvd.) in Barrio Barretto. This move was necessary due to the escalating rent and cost of utilities at our previous location. We have over 1,100 members, the majority being Filipinos who are USN retirees.